O/o Deputy Commissioner, Nalbari . Applications are invited in the Standard Form as published in the Assam Gazette in Part-IX from the intending citizen as defined in Articles 5 & 6 of the Constitution of India for filling up the following vacant posts under the amalgamated establishment of Deputy Commissioner, Nalbari . Age: Candidate should not be more than 38 years and not less than 18 years as on 1st January/ 2018.The upper age limit is relaxable in case of SC/ST candidate as per Rules. Educational Qualification: Minimum H.S.L.C. passed or an equivalent Examination of Recognized University or Board along with 6 months Recorder's Certificate Class Training from Assam Survey &Settlement Training Center, Guwahati. Pay: Pay band Rs. 14,000.00 to 49,000.00 p.m, Grade Pay 6200 (PB2) plus other allowances as admissible as per rule issued time to time. 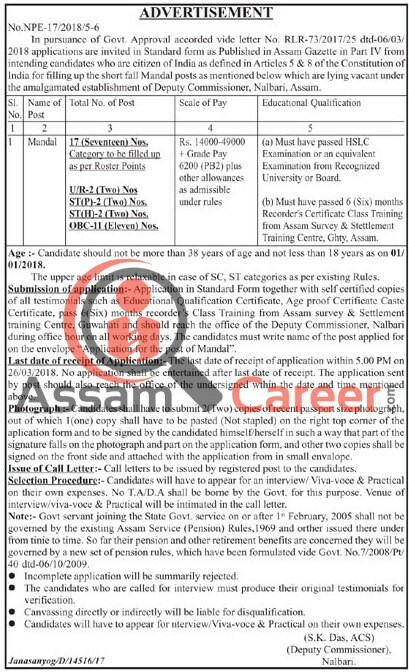 How to apply: Application in standard form together with self attested copies of all certificates and testimonials should reach the office of the Deputy Commissioner, Nalbari on or before 26/3/2018.The candidates must write name of the post applied for on the envelope "Application for the post of Mandal". The candidate will have to submit 2(two) copies of recent passport size photographs.